Hey NS, I'm sure lots of you have seen the video of the cool and unique jib set up that a Russian skier made. Once I saw the video I New I had to make one. 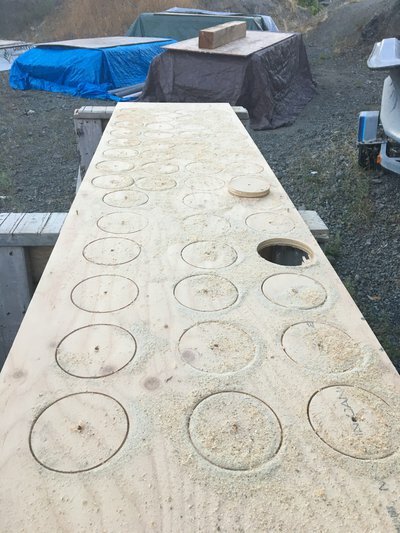 I started off by using the 5 inch hole saw to cut grooves into the plywood for the pucks. I ended up cutting 47 to give me 35 inches (88cm) of a rail which I thought would be plenty long enough. Don't cut all the way through and just enough to make the groove as we will be cutting through it later. What I did next is now use the 1 1/8 hole saw blade to cut the middle hole for the axle metal pipe. We make the grooves because if you've ever used a hole saw blade it will kick if there is no pilot hole. After cutting the middle holes holes we go back to the 5 inch blade to complete cutting out the big holes. Thats is as far as I've gotten last night and will update it once I do more! Or you could just cut up PVC pipe and put it on an axle but yeah.